« Harley-Davidson Short Movie Winner. Published by Cyril Huze December 15th, 2008	in Editorial and Painters. “Greetings to all eBay shoppers. I have a VERY special offering that has never been made before…..I have spent the last year and a half building a studio/gallery space in Golden, Colorado (see image above) . Since we are nearly finished I have before me the arduous task to organize all my prints. Looking through my flat files has yielded many forgotten treasures from the past. Rather than finding a place for everything I thought I would make some of these available at a significant price reduction for all those who may have liked a piece but could not afford one. 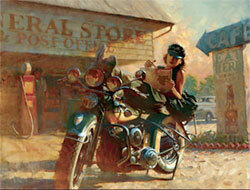 In 1998 when I became the archival painter for Harley-Davidson, I was published by Segal Fine Art. They set my pricing structure and I have not raised the prices since, and in my business you cannot drop them because of the investment of all those who purchased previously. I have included test prints, old posters, and unique items stuck in my drawers for years. I will be implementing a reserve on all items to keep them from being given away, but I assure you these prices have NEVER been lower. Anyone buying any of these items can rest assured they will arrive in perfect condition along with the certificates and appropriate paperwork. For all those who reside in the continental U.S. I am offering free shipping on all unframed prints. Happy Holidays and Good Luck! ” David Uhl, Uhl Studios.